Noteable point and proofs that “Best practices do not work” and “Tuning eBGP policies can create huge traffic shifts”. I point this out because every time I criticise routing protocols like BGP or MPLS or OSPF, someone wants to argue that they are great because they work. And they must be good because that’s what the everyone uses. Blah, blah, blah …..
It’s true that replacing BGP seems to be an impossible task but lets be honest and realise that BGP is 20 year old protocol that has serious problems and limitations that are not yet solved. We just hope that it keeps working and pretend that the technology foundations of networking are perfect. 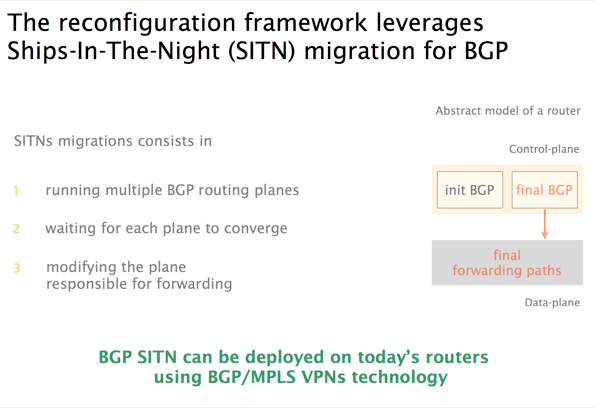 Fortunately, Laurent proposes some changes to BGP that I suspect no one will want to implement. Correct me if am wrong in the comments.